Reviewed by Elaine Harris This month we commemorate the centenary of the fateful landing at ANZAC Cove: a campaign made up of political and military blunders, bureaucratic bungling and months of wasted lives and needless tragedy. No-one doubts the horrors of those unimaginable months with little water and less organization. Yet however odious comparisons may be, historians past and present (including many who were there) insist that although Gallipoli was horrendous, the Western Front was so very much worse. Millions of lives lost, millions more ruined, damaged or altered beyond all comprehension. It is impossible for any of us to know how we would react in those circumstances, only hoping such tragedy would bring out the best in us. 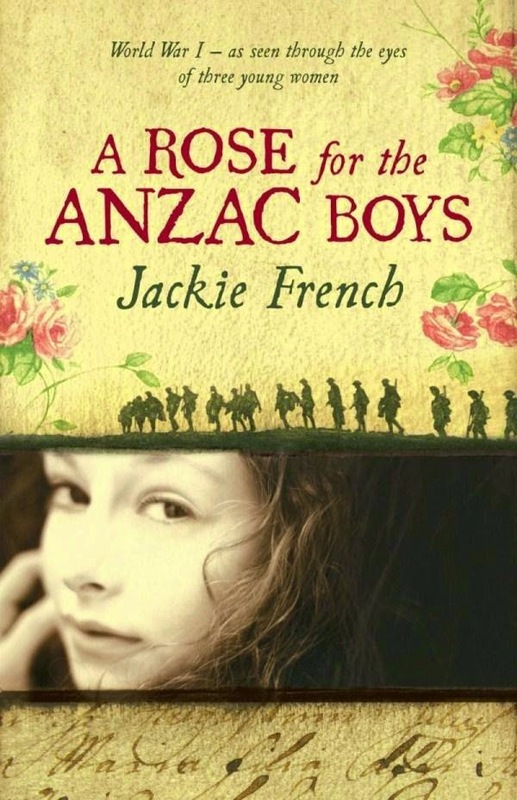 Five years ago, in preparation for a radio interview, I dipped into the award-winning YA novel, A Rose for the ANZAC Boys by Australian Children’s Laureate Jackie French, covering as much as I could in the time allowed, (conducing several interviews each day sometimes leaves little time for a full read) and devoured all the notes at the back of the book. Last month I did it -- read the entire book in less than 24 hours, sobbing unashamedly throughout. Don’t be fooled, though. This is no sentimentalised, girlie weepy. A teacher colleague of my husband’s read it to her year 5-6 class in 2010 and for the first time held her reluctant reader boys spellbound. This book tells it all without jingoism or bitterness against any enemy; without an examining of rights and wrongs - except the smugness of the hierarchy who gave the orders while living the high life behind the lines. (It happened.) We meet soldiers, nurses, ambulance drivers, orderlies, a chaplain, Turks and Germans, and many, many people who just wanted to do their bit, including our three female protagonists: Midge, Anne and Ethel. It takes you to railway station canteens dispensing sandwiches and cocoa, casualty clearing stations, ambulance runs and the fear, mud, Blood and gas of the trenches. Through the story and without any sense of being taught anything, we also learn something of the class system and attitudes of the day, roles and perceptions of women and the determination of those kicking against the traces, often against all odds. Yet, like the best books worth remembering, while plumbing the depths of tragedy, the book ends on hope: leaves you not only with a sense of the future but also a view of it decades later from the perspective of the descendants of those involved. It sheds a light on the annual ANZAC Day parades and services and why these ceremonies still hold meaning which ought never to be de-valued, sensationalised or forgotten. As for historical accuracy, Jackie French wept her way through many letters and diaries of the day, living as closely as anyone ever can the experiences of those who were there. This is not a new book but a timeless one worth reading or re-reading this year.